FLEET (Fresh Look at Eastern European Trends; English for “agile, nimble”) is a FES-initiated network of young, open-minded experts specialising in security and cooperation in wider Europe. Members of the network come from across the OSCE area and work in academia, think tanks, political institutions and business. Since 2015 the group regularly meets for intensive workshops to discuss current challenges to security and peace in Europe and develop joint policy proposals on how to resume cooperation in the current crisis in order to ultimately restore the indivisibility of security in Europe. The regional composition of FLEET reflects the necessity to jointly discuss those issues with the EU, Russia and the countries in the shared neighbourhood. Each year FLEET focuses on a different topic within the broader thematic frame of security. This year’s topic is the so-called “Islands of Cooperation”. The idea behind this topic is simple: in the current deadlock we need to try cooperation in small steps. This approach presupposes that despite the crisis in relations and the lack of trust, there are certain shared interests among the states and societies. Such areas of shared interests and potential cooperation are called “islands of cooperation”. By jointly working on these “islands”, the network of cooperative relations will gradually grow denser and trust will increase as well, ideally spilling over into other areas. Once trust levels can be restored, the hope is that finding regional answers to the fundamental issues and challenges will become possible in the long run. 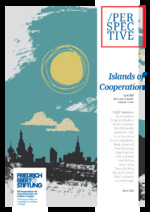 In a series of workshops in Vienna, FLEET members identify concrete islands of cooperation – such as radicalisation prevention, joint threat perceptions or development of small businesses – and write policy papers.